Ortega Landing condominiums in Jacksonville, Florida. 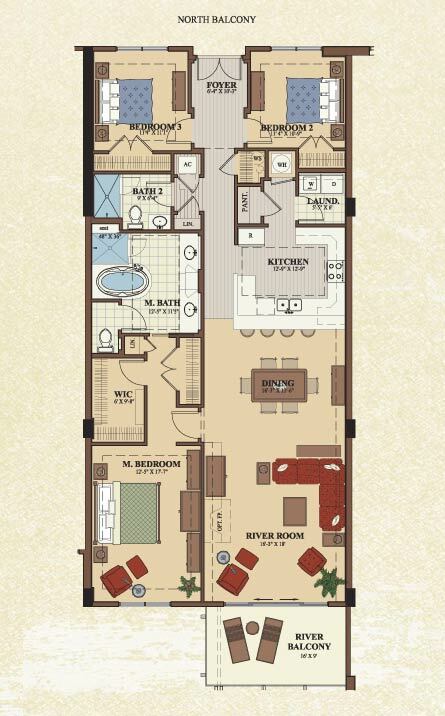 Ortega Landing is a new 38-residence riverfront condominium and marina community on the Ortega River with 192 boat slips available for purchase. Enjoy resort-style amenites including five-star dockhand services, clubhouse, swimming pool and spa, gourmet grilling area and covered parking. See sitemap or view in PDF format. Anchored in one of the city's most prestigious neighborhoods, Ortega Landing is a secluded luxury development bordered by gracious older homes, manicured parks and abundant waterways ready for exploration. This 192-slip marina provides a protected anchorage in a cove that is perfectly positioned to safely shelter your boat from wind and waves. A few steps and you can come aboard with ease. 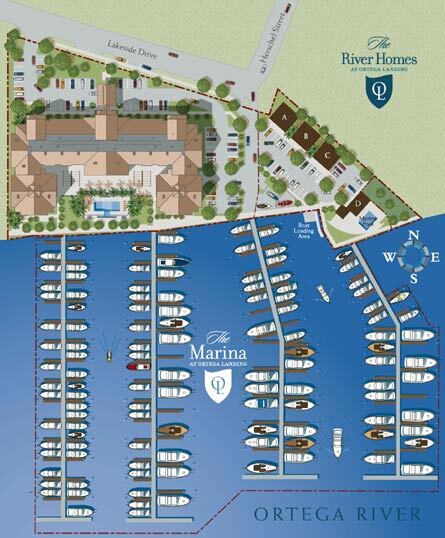 The marina provides dockage for boats 30 to 77 feet in length as well as "T" heads allowing for boats 100 feet plus. 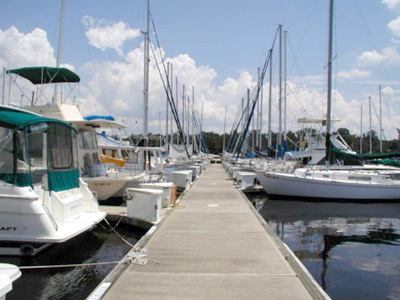 The marina is just five minutes from the point that the Ortega River flows into the St. Johns River and the beautiful Intracoastal Waterway. From there you are only a short trip to the Atlantic Ocean. 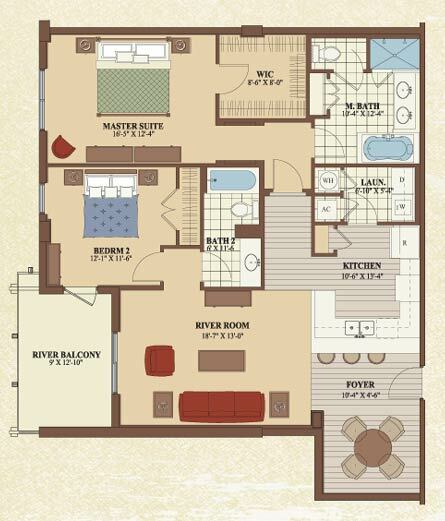 The condo residence at Ortega Landing features 2,600 square foot, 3 bedroom and 3 bathroom floor plans with beautiful views of the Ortega River. 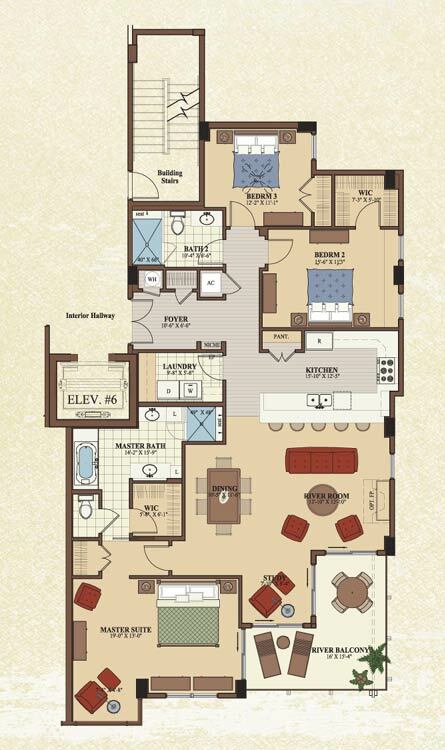 Standard features include private elevator access, 9-foot ceilings, hardwood flooring in foyer, kitchen, dining and family rooms (per plan), tile in all baths, carpet in bedrooms, extensive soundproofing, 42" solid wood cabinetry, kitchen island (per plan) and GE Profile stainless steel appliance package. Each home is thoughtfully planned to take advantage of panoramic windows, tall ceilings and natural lighting, creating interiors that flow naturally and bring the outside in. Expect sophistication, enhanced by rich detailing and an array of luxurious touches to rival the most exquisite residences anywhere; and, hidden beneath the gorgeous surfaces is a tech-savvy infrastructure to keep your home running smoothly and efficiently. Please contact me if your are interested in having an independent REALTOR® who does not work for the developer represents you. There is no cost to you for my professional service. Please contact me for more info and pricing.